OK, quick question for you: What do Rupert (aka Ronald) Psmith and Ray Langston from CSI have in common? Go on, have a guess. No idea? Give up? Well, I shall enlighten you. You see, it turns out that they are both crossover characters. Dr Langston appeared in episodes of CSI: Miami and CSI: New York in 2009 and, in Leave it to Psmith, Wodehouse engineers a trip to Blandings Castle for Psmith, thus bringing him into contact with Lord Emsworth and other Blandings Castle inmates in what became the second in the Blandings Castle series and the last of the four Psmith books. And make no mistake. Despite the title of the book, Leave it to Psmith is very much a Blandings Castle tale. 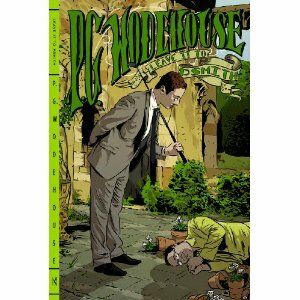 Whereas the three previous Psmith stories form part of Wodehouse’s “school” phase and tend to hinge on Psmith’s peculiarly superior attitude to life, Leave it to Psmith is a romantic comedy, more representative of Blandings and Wodehouse’s mid-career style. Indeed, the plot of Leave it to Psmith has so many similarities to that of the first Blandings novel, Something Fresh, that it could be used as exhibit A in the oft-raised accusation that Wodehouse simply used the same plot over and over again. At the outset of Leave it to Psmith, we find Psmith (the “P” is silent as in psychic, ptarmigan and phthisis) in reduced circumstances. His father’s money has gone and he has just resigned from a promising career as a monger of fish for his uncle, a mogul in the piscine world. Freddie, Lord Emsworth’s imbecile younger son is desperate for cash to invest in a bookmaking business and his uncle, Joe Keeble is also in need of cash to give to his niece Phyllis Jackson to enable her husband, Mike to buy a farm without his wife, Lady Constance knowing. To complete the circle, Mike is Psmith’s best friend from school. All clear? Psmith and Freddie come into each other’s life when Freddie answers a personal ad placed in the paper by Psmith, wherein he offers to take up any job for cash. Psmith agrees to steal a necklace belonging to Lady Constance, Freddie’s aunt. Joe will then be able to draw a large sum of money to replace the necklace with Lady Constance’s blessing. He will then split the cash with Freddie and return the stolen necklace to Lady Constance. At this point, enter Lord Emsworth. Despatched to the Senior Conservative Club in London by Lady Constance to bring a Canadian poet back to Blandings, he manages to offend said poet, who storms off in a huff. Psmith, who happens to be in the club at the same time steps into the breach as Emsworth, having lost his glasses, is under the impression that Psmith is actually the poet. Although unaware that Emsworth is Freddie’s old man, Psmith is desirous of visiting Blandings as he has fallen in love with one Eve Halliday, who has been engaged to catalogue the Blandings library and is, again unbeknownst to Psmith, a childhood friend of Phyllis. The scene is thus set for a typical Blandings story, a mixture of romantic comedy and high farce. After misunderstandings aplenty and despite the best efforts of the Efficient Baxter, Emsworth’s secretary, and a couple of American thieves, one of whom is at Blandings in her capacity as a leading poet, Psmith ultimately prevails, getting the girl and ensuring that both Phyllis and Freddie are put in funds. All’s well that ends well, apart from Freddie’s love life, which remains unfulfilled. Even Lord Emsworth is left happy as he is able to sack Baxter, who ends up throwing flowerpots through Emsworth’s bedroom whilst wearing lemon-coloured pyjamas, in a scene that should be read in private lest you be thought mad for laughing out loud in public. Leave it to Psmith is a pacey, madcap story that shows both Wodehouse’s weaknesses and his strengths. As well as recycling some of his standard plot devices, the plot is over-dependent on coincidence and one really shouldn’t think too hard about the logic and plausibility of the plot, which at times are tissue-thin. On the other hand, not only are many of the set piece scenes laugh out loud funny but Wodehouse’s writing style is, in Leave it to Psmith, approaching its full majesty. In truth, never mind the plot, just feel the fluidity and precision of the writing. Psmith was not to appear in Wodehouse’s writing as he freely admitted that he could not think of anything else to do with him. He’s never been one of my favourite Wodehouse characters as he mainly features in Wodehouse’s early books which are a bit too much like school stories for me. Nevertheless, as a valedictory appearance, he could have done much worse than Leave it to Psmith.